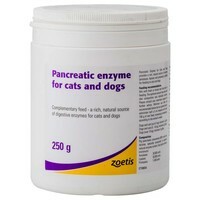 Pancreatic Enzyme for cat and dog (formerly Pancrex Vet Powder) is an essential treatment for exocrine pancreatic enzyme insufficiency (EPI) and associated diarrhoea, intestinal maldigestion and malabsorbtion in dogs and cats. This supplement contains the pancreatic enzymes normally secreted into the intestines. Use as a food supplement to help combat disease and return your dog or cat's digestion back to normal. Give half a 5ml teaspoon with each 100 g of food (increasing as necessary). A 250g tub provides approximately 240 half teaspoon (2.5ml) doses. Additional therapy or a special diet may be required. Consult a Veterinary Surgeon for advice. Wash any powder off hands after use. Store below 25oC in a dry place. Store in the original container tightly closed. For animal treatment only. Keep out of the reach of children. If your dog suffers from EPI then this is perfect fro treating it, my GSD was on Panzym powder for years , then I came across this powder which is ,I would say , better than the more expensive Panzym. I would highly recommend this product. My 7year old GSD was diagnose with IBS about one year ago and was buying Pancrex powder from them at a high price, but a friend told me about Vet UK, and very pleased with this site, I ordered two first time then when i start on 2nd reordered another so i don't run out. Fantastic product at half the price my vet was charging. My 2 year old German shepherd was seriously ill & diagnosed with EPI. This supplement has been a life-saver for him & mixes easily with his special diet. Thoroughly recommend it & great service, delivered within 2-3 days. The product is absolutely brilliant, my dog was very ill and they even asked if I wanted to put him down. This is easy to mix into his special food and he is happy to eat it all up. Would definitely recommend it.